Muditā (Pāli and Sanskrit: मुदिता) means joy; especially sympathetic or vicarious joy. Also: the pleasure that comes from delighting in other people's well-being. The traditional paradigmatic example of this mind-state is the attitude of a parent observing a growing child's accomplishments and successes. Mudita should not be confounded with pride as a person feeling mudita may not have any interest or direct income from the accomplishments of the other. Mudita is a pure joy unadulterated by self-interest. When we can be happy of the joys other beings feel, it is called mudita; the opposite word is envy or schadenfreude. Mudita meditation is used to cultivate appreciative joy at the success and good fortune of others. Buddhist teachers interpret mudita more broadly as an inner spring of infinite joy that is available to everyone at all times, regardless of circumstances. "The more deeply one drinks of this spring, the more securely one becomes in one's own abundant happiness, the more bountiful it becomes to relish the joy of other people." Joy is also traditionally regarded as the most difficult to cultivate of the four immeasurables (brahmavihārā: also "four sublime attitudes"). To show joy is to celebrate happiness and achievement in others even when we are facing tragedy ourselves. According to Buddhist teacher Ayya Khema showing joy towards sadistic pleasure is wrong. Here there should instead be compassion (karuṇā). The "far enemies" of joy are jealousy and envy, two mind-states in obvious opposition. Joy's "near enemy," the quality which superficially resembles joy but is in fact more subtly in opposition to it, is exhilaration, described as a grasping at pleasant experience out of a sense of insufficiency or lack. ↑ Salzberg, Sharon (1995). 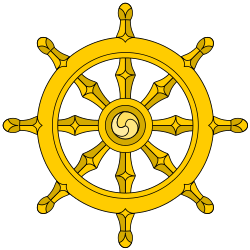 Loving-Kindness: The Revolutionary Art of Happiness, Chapter 8 "Liberating the Mind through Sympathetic Joy". Boston: Shambhala.